Sara Romoli from SR Productions in New York, NY contacted Studio 544 to create a new online landing page for her new event planning business to help with the company’s overall SEO strategy. The full screen landing page offers a video background and online contact form. 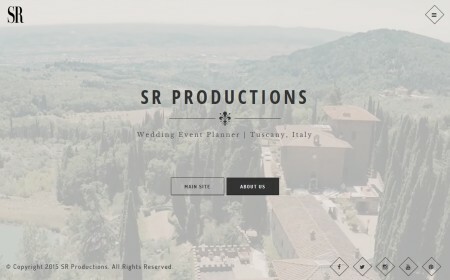 SR Productions is an Italian wedding planning company based in NYC and Florence, Italy specializing in luxury Florence (Tuscany) wedding planner and event services. SR Productions has over 10 years experience in the design, production, and execution of world class events. The landing page for SR Productions incorporated a responsive design so it would look good on multiple devices including tablets and smart phones.